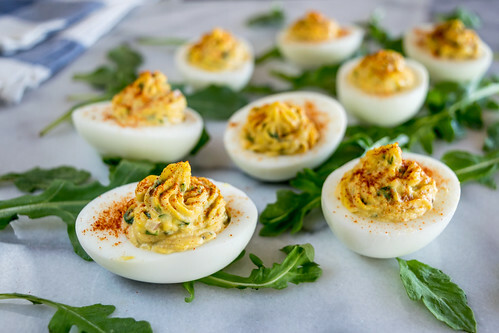 There are a variety of recipes for deviled eggs to choose from, but the one we are sharing today is a classic from the definitive American cookbook, The Joy of Cooking. This dish has seen countless variations over the years since its humble beginnings in ancient Rome, and now just about every country has its own take on this festive appetizer. You can find the most plain recipes with two or three ingredients as well as modern versions using eclectic flavors like wasabi and pickles. 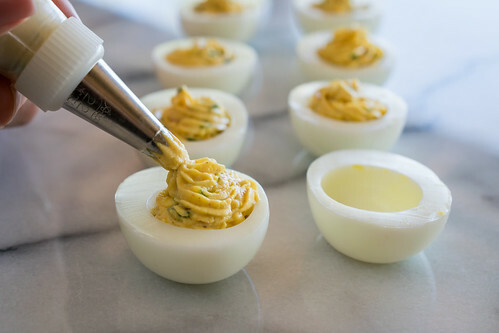 Our deviled eggs use just a few basic ingredients: the golden yolks are combined with fresh parsley and chives, gently blended with tangy dijon mustard, minced shallots, and a spoonful of smooth mayonnaise, then mixed together into an elegantly creamy filling seasoned with a splash of white wine vine vinegar, Worcestershire sauce, and a pinch of cayenne giving these wicked hors d’oeuvres a devilishly irresistible bite. 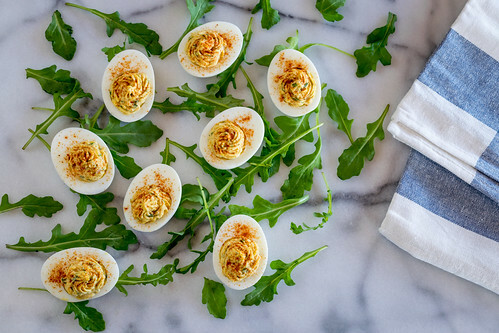 Deviled eggs are often garnished with a sprinkle of paprika for color. Our favorite kind is called pimentón de la vera, a delicious Spanish variety with an enticing smoky flavor that adds a complex depth and a slight kick to this timeless dish. Another tradition is to add Worcestershire sauce, a savory, salty, and slightly sweet condiment that usually contains anchovies, but there are vegetarian options available online and in natural food stores that taste just as good as the original. 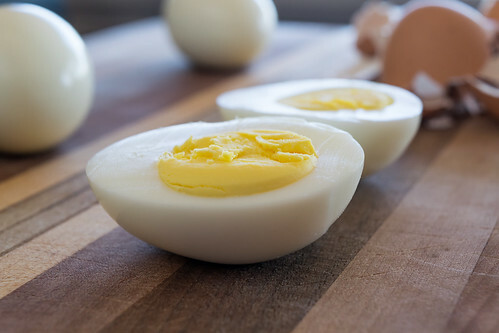 The phrase “hard-boiled egg” is slightly misleading since they shouldn’t actually be boiled. 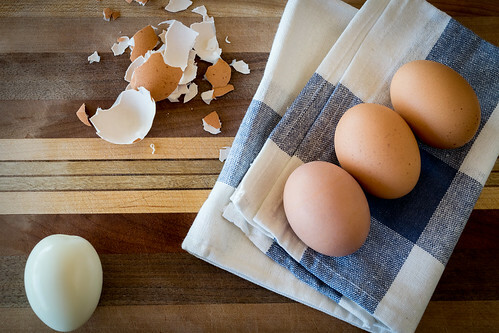 A gentle simmer is better because a strong rolling boil can knock the eggs around and potentially crack them. 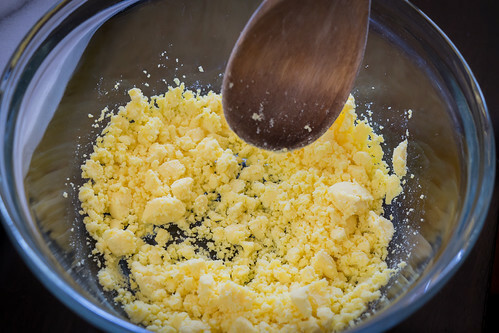 The secret to a perfectly textured yolk is letting the eggs simmer for exactly 14 minutes, then plunging them into a bowl of cold water to immediately stop the cooking process. If they go any longer the yolks dry out and lose their creaminess. Using these simple techniques will give you tender and delicious results every time. 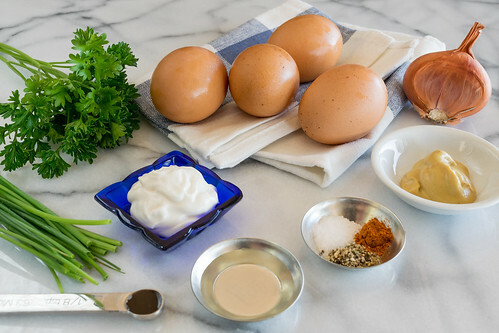 And when you mix that perfectly cooked egg with fresh herbs, tangy dijon, and bold spices, the simplicity of the bright ingredients makes this dish a flavorful appetizer that is zesty and light, yet rich, decadent, and smooth as silk. Bring about 2 quarts of water to a simmer in a medium pot, and then gently lower the eggs into the water. Simmer gently, without allowing it to boil too vigorously, for 14 minutes. Then remove the eggs from the pot and place them into a bowl filled with cold water to stop them from cooking inside their shells. 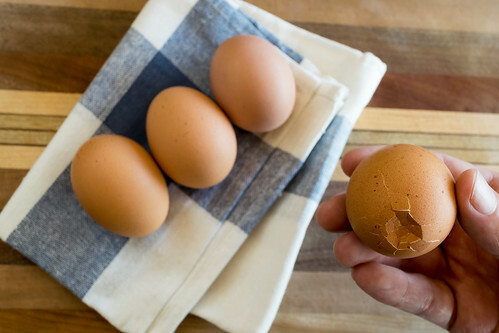 Once they are cool enough to handle easily, about 2 minutes, remove the shells, slice the eggs in half lengthwise, and carefully separate the yolks from the whites, leaving the whites intact. 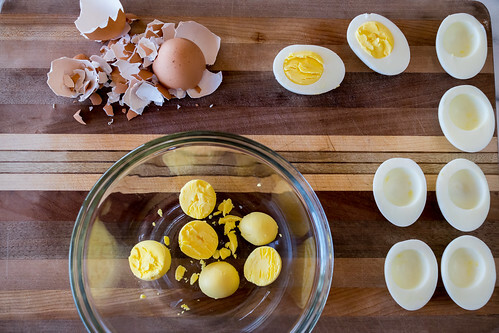 In a small bowl, mash the egg yolks until no large pieces remain. 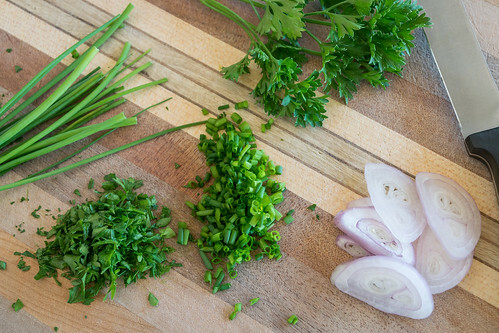 Add the mayonnaise, parsley, chives, shallots, dijon mustard, white wine vinegar, Worcestershire sauce, salt, pepper, and cayenne, and stir well until blended and creamy. 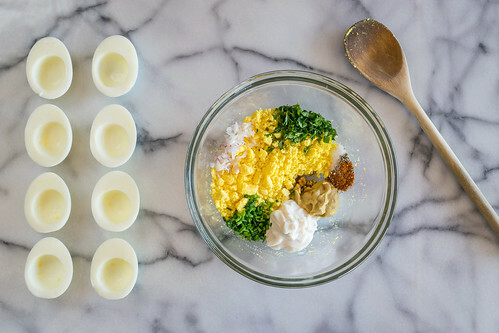 To fill the egg whites, you can simply spoon the yolk mixture into each egg white cup, using about a tablespoon of mixture for each one. You can also place the mixture in a piping bag (or a resealable plastic bag with one corner cut off) and fill them decoratively. Sprinkle the eggs with pimentón de la vera or paprika, and enjoy! — Worcestershire sauce is traditionally made with anchovies, but there are vegetarian brands available. We use Annies. — Pimentón de la Vera is a smoked Spanish paprika that is intensely flavorful and delicious. It is available online or from some grocery stores. 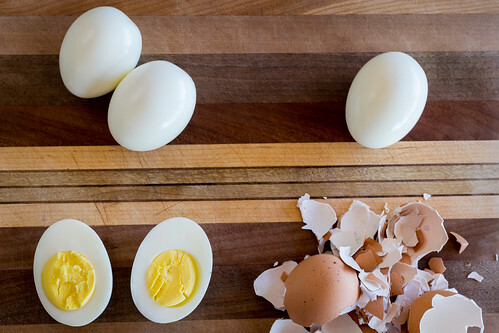 — These eggs can be made ahead of time and refrigerated, just let them sit at room temperature for 10 to 15 minutes before serving.